Well finally decided to post my most current project. 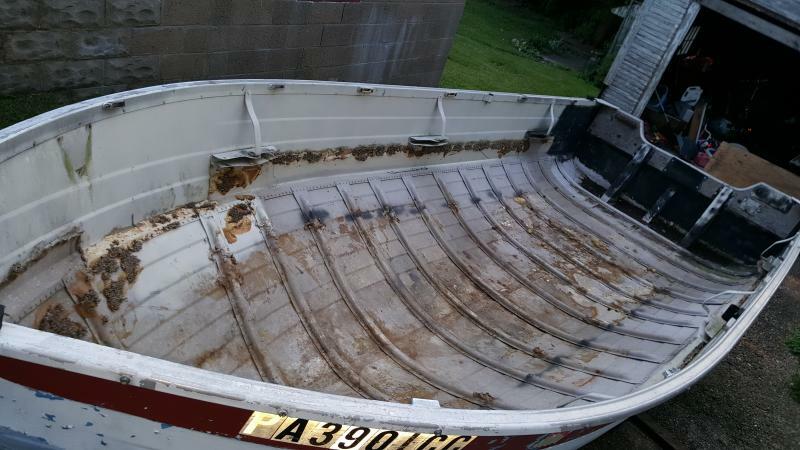 I have always been a big and fast fiberglass boat guy but was getting tired of the time spent on the cleaning and maintenance of it. I told myself no more carpet to scrub. No more scrubbing fiberglass. No more 4mpg big motors. 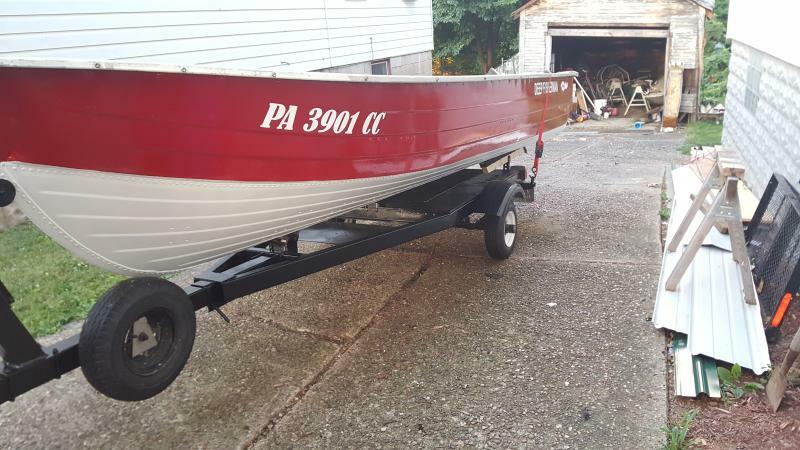 Picked up a 1972 mirrocraft deep fisherman. Was very rough when I first brought it home but my plans were to gut everything anyway. The PO had a very poor plywood floor that was rotted away along with a small front casting deck. Removed the middle seat. And liquid nailed brown outdoor carpet all around up the gunells. 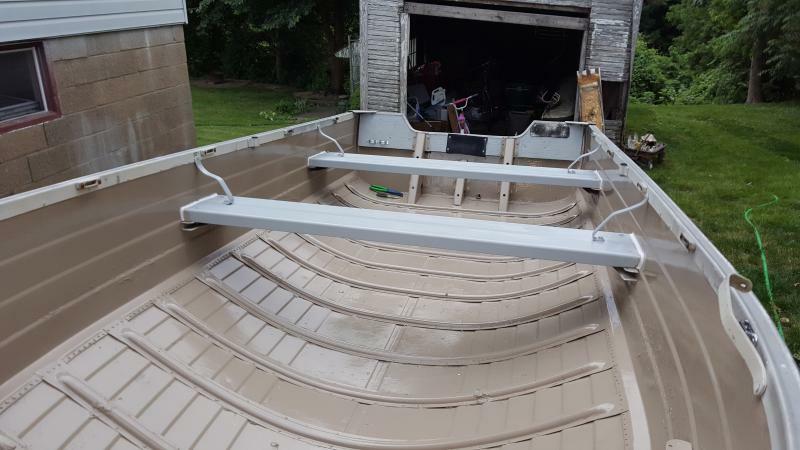 After a good long weekend removing, scraping and sanding the interior of the boat left me with a blank canvas as to what I wanted to do to it. My initial plans going in was ZERO wood aside from transom. A small front casting deck/sunspot for the wife. I am still currently working it and still taking pictures as I go. The exterior emblems where redone and a sample section of paint was done to see if I like the color. Benches were made from an old set of aluminium bleachers. All paint is SW industrial oil base. I do alot of painting and felt it was the best product for my needs. 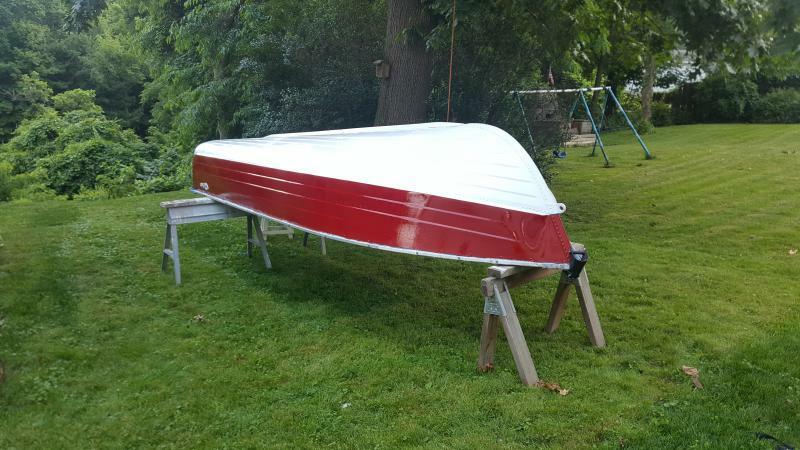 I still haven't finished the exterior of the boat as this weather is cooperating with my time. Along with the trailer needs rewired and painted. As soon as I can get back up to the store I'll start floatation boxes for under the seats and casting deck. I'll add more photos as I proceed with the project. File comment: Finished front deck with adhesive backed traction tape. I know the spacing is off but I had screw head in my way. 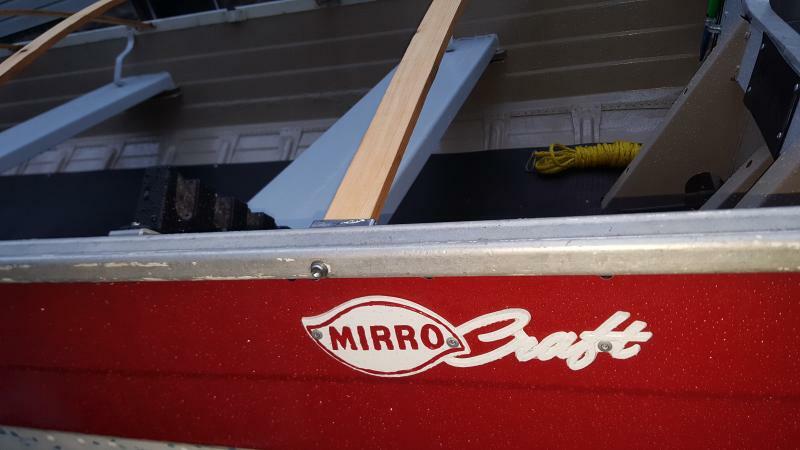 Welcome to the 14' MirroCraft deep fisherman remake club! Yours is 6 years younger than mine. I like your front deck. 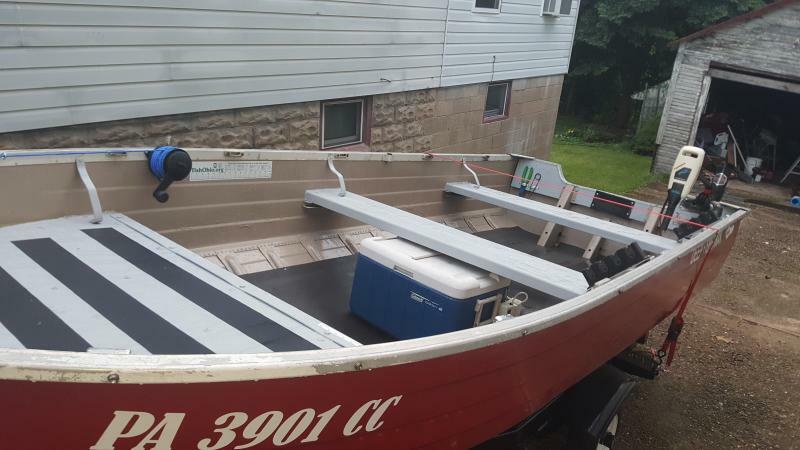 My front deck will sit atop the gunwales and hold an electric anchor winch and trolling motor. Mine still sits inverted on saw horses, whilst getting painted as time and weather permit. 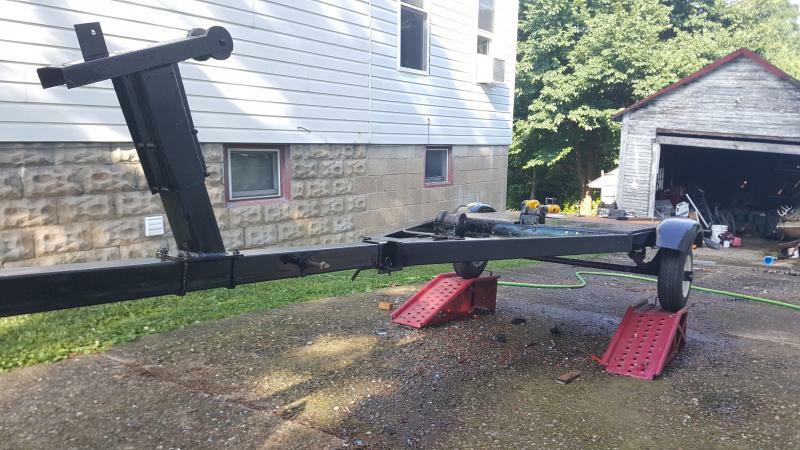 Finally got some more free time and good weather to start working on the trailer. Pulled boat off and put her upside down on a set of saw horses. First thing first, remove lights, wiring, plate and crank. The trailer it self was in better shape then originally perceived. Aside from wire wheeling the entire thing it has been the easiest job so far. I went to the local hardware and bought a can of rustoleum in a gloss black. Went on real well and I think I will only need 2 coats to have it look good and protect the metal. 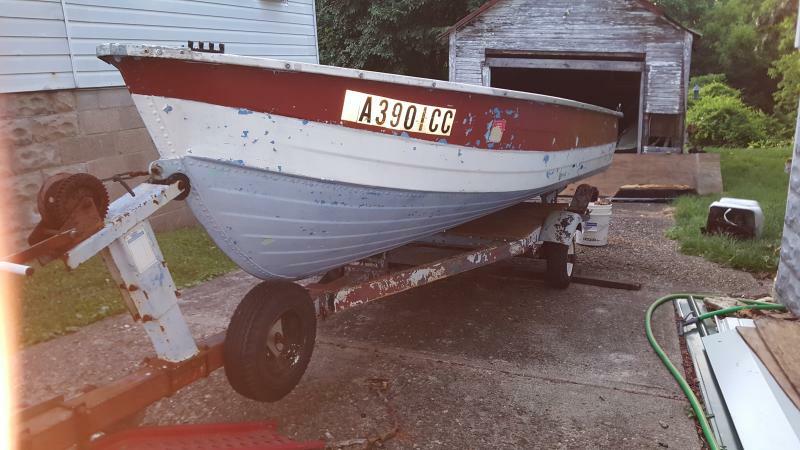 Hopefully tomorrow I can get a second coat on the trailer and start the exterior of the boat. Got a productive day in today. Got final coat of paint on. Cleaned up crank wheel. Made new bunks. Finished lights. Attached small storage box and made bracket for lisence plate. All in all a good day. 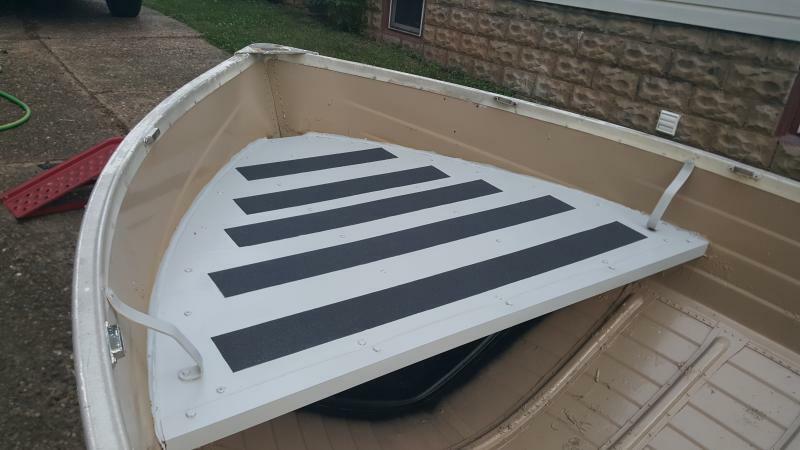 Now that the trailer is ready for the road it's on to finish the boat. Slow down! you're moving too fast! I can't keep up! Trailer looks good. 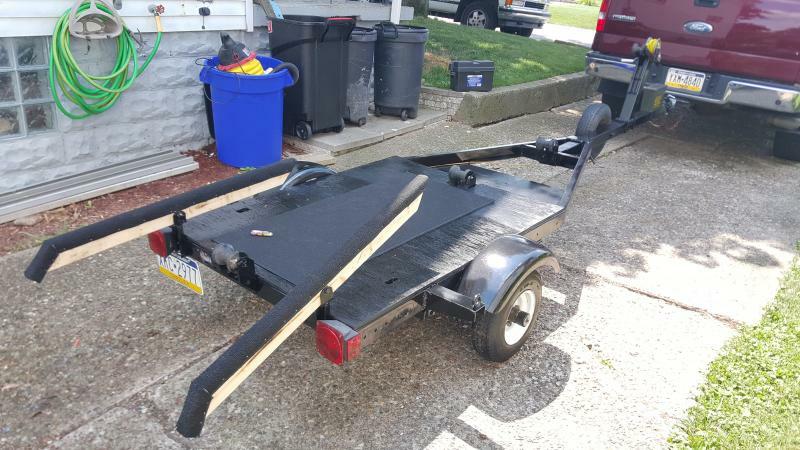 But, what was it before it was a boat trailer? 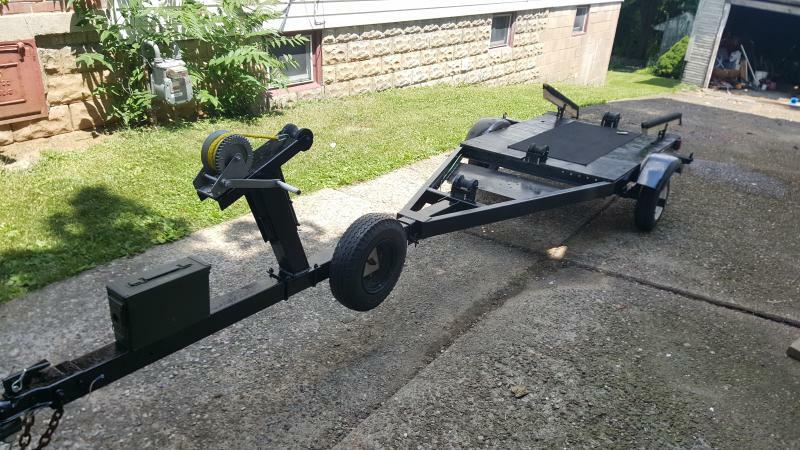 It's a sterling tilt trailer and the PO put a deck on it. Still scratching my head on why, but it is still solid so I figured I would leave it. There is old sign of the hull scraping the wood. My guess was when loading or unloading. Rather it hit wood than a steel crossbar. That all I can think of. Finally got the outside finished printed and new decals installed. Pretty pleased with the build so far. Still a couple of decisions to make. I need some sort of storage box to store docking lines, safety equipment, and other misc items. Also gonna start on electric box. Only want a 12v outlet, switch for lights and switch for plug. I made a switch box out of a plastic outdoor electric box and cover. A coupe of toggle switches with inline fuses inside. 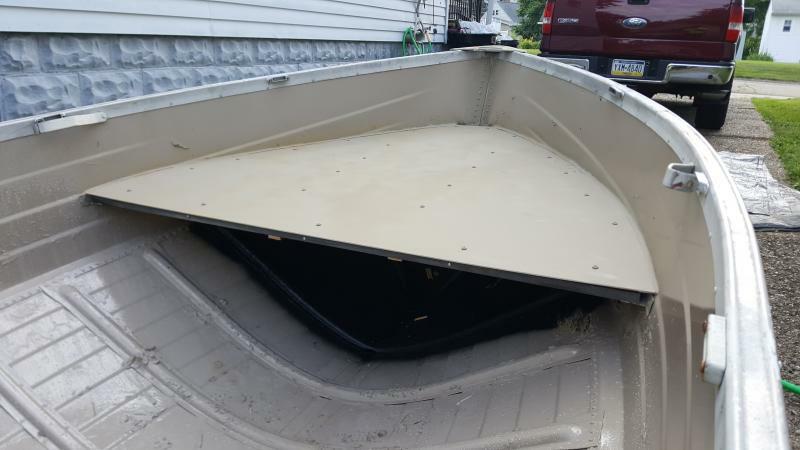 I have the same boat that I'm currently working on (look forward to my thread in the near future ), what did you use to seal the bottom? Looks great!! I applied Gluv-it to seal a few leaks and was looking at camo paint at Super Marine (http://supermarinepaint.com/marinepaint ... product=90). Saw someone who used this and it looked great. My bottom will mostly be covered with a deck so I'm not putting too much work into it. The boat only had 2 small leaks from screws the PO didn't pay attention to. I drill the holes out to an even 1/8. Used a hardware special marine epoxy, rivets and washers to seal the holes. Worked like a charm. looks great what did you cover your bunks with?